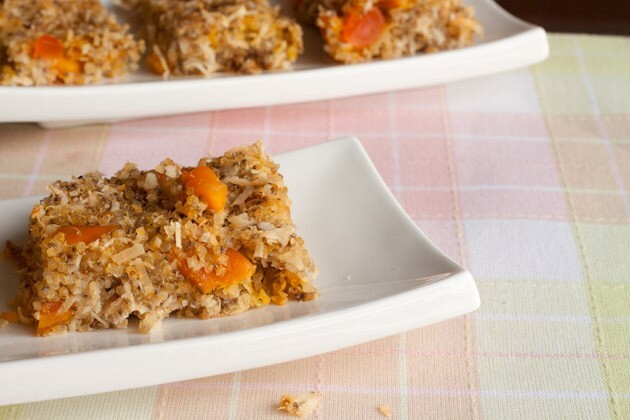 Papaya, mango, and coconut fill these ultra healthy bars with tastes of the tropics. Rinse quinoa by placing it in a strainer and running it under water for 1 minute. Transfer for a medium sized saucepan, add water and cover. Bring to a boil, then reduce to simmer for 20-25 minutes. Don’t remove the lid while cooking. Once complete, remove lid and set aside. Combine coconut milk, eggs, and chia in a small bowl. Stir and set aside. Preheat oven to 325F and line a 9×13 pan with parchment paper across both sides for easy lifting and set aside. 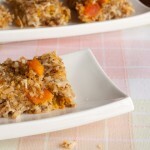 In a large bowl combine quinoa with the coconut milk mixture. Stir until fully combined. Press firmly into prepared pan and bake for 30-40 minutes or until lightly golden. Remove from oven and allow to cool for 20 minutes. Slide out of pan and continue to cool for another 40 minutes before cutting. These bars are great but can get a little bit messy. The longer they sit, the firmer they’ll get. Or, stick them in the fridge for a couple of hours.